Joseph M. Williams, Professor Emeritus of English and Linguistics at the University of Chicago, died Friday, February 22 at his home in South Haven, Michigan. Williams will be remembered as the founder of the University’s writing program and for his contributions to the development of some of Chicago’s most influential books on the teaching of writing. These include his Style: Toward Clarity and Grace, as well as the book he co-authored with the Gregory Colomb and the late Wayne Booth, The Craft of Research—the third edition of which is slated for publication this spring. 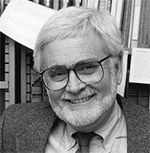 Williams was also a contributor to Kate L. Turabian’s A Manual for Writers of Research Papers, Theses, and Dissertations and was at work on the accompanying Students Guide at the time of his passing. William’s contributions to the University and its students, and to writers and scholars everywhere, will most certainly be missed, as will he himself. . . .
Chicago 10, the innovative documentary that revisits the tumult of the 1968 Democratic National Convention and the Chicago 8/7 conspiracy trial of key antiwar activists a year later, opens Friday in select theaters. 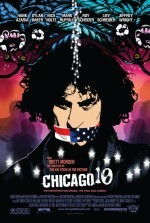 The film is directed by Brett Morgen and combines archival footage of the chaos of August 1968 with animated reenactments of scenes from the trial. Plus a soundtrack ranging from Black Sabbath and Steppenwolf to the Beastie Boys and Eminem. Morgen has been quoted as saying that he “wanted to do the myth of Chicago rather than the history,” and “if you want to know the history of what happened in Chicago so long ago, then read a book.” Well, we think understanding history is pretty darn important and are happy to oblige. Twenty years ago we published the most complete account of the events surrounding the 1968 DNC, David Farber’s Chicago ’68. That book is innovative itself, creating multiple perspectives reflecting both police and demonstrators. Farber shows the developing plans of the antiwar movement for protesting the war in Vietnam during the convention, as the shocks of 1968 shift the ground—the Tet offensive, President Lyndon Johnson’s withdrawal from the re-election race, the assassination of Martin Luther . . .
Now Available in Paperback Peter Dear’s intellectual journey begins with a crucial observation: that scientific ambition is, and has been, directed toward two distinct but frequently conflated ends—doing and knowing. Teasing out this tension between doing and knowing during key episodes in the history of science, he reveals how the two principles became formalized into a single enterprise, science, that would be carried out by a new kind of person, the scientist. “The portraits of individual scientists, from Newton, Boyle, and Faraday to Einstein and Bohr, are vivid and pithy; has a good ear for the apt quote that lets us hear their voices.”—Eric Ormsby, New York Sun “ shows how mechanistic explanations in physics and chemistry became ever more frequent after the industrial revolution, only to be supplanted by the nihilism of quantum theory in the social turmoil that followed the first world war. It is full of insights into how society, culture and people’s perception interweave across biology, chemistry and physics.”—Adrian Barnett, New Scientist Read the press release. . . . In a review appearing in last Sunday’s edition of the Toronto Star Christine Sisimondo begins: In academia, generally, food writing is relegated to… ‘the kind of thing you might find in a newspaper’—not in the hallowed halls of higher ed.… But of late, “that’s been changing. Anthropology and environmental science departments are beginning to redefine the study of food, as not just about nutrition and shortages through the ages but as a serious cultural indicator. Sisimondo uses Pierre Laszlo’s new book Citrus: A History to demonstrate her point: Laszlo is a chemistry professor who is probably best known for his previous book, Salt: Grain of Life, and has now moved on to one of the next great essential staples, citrus. Laszlo has a truly charming way of telling the story, weaving his personal biography into the tale of the migration of various fruits around the world. He is careful, though (and tells us he is worried about overstepping his bounds), to never let the personal overshadow the story of lemons, limes, grapefruits, oranges and, of course, such exotics as ugli fruit, kumquats and yuzu.… while there’s … plenty of great history in Laszlo’s account, it’s interdisciplinary, adding to . . . 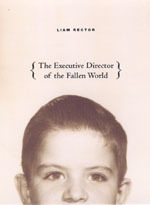 This month’s Boston Review is running a nice piece on Liam Rector’s The Executive Director of the Fallen World—the last book of poetry Rector would publish before taking his own life in late August of 2007 after battling both colon cancer and heart disease. But as reviewer Robert Schnall notes, though the poet may be gone, his poetry continues to have a profound effect upon its readers with its “hard-won insight and incandescent gallows humor… intermixing pathos with practical wisdom, tragedy with relentless sass.” The review continues: Often his mordant irony and slang diction prove to be his best defenses against despair, as in “So We’ll Go No More,” which presents a dying speaker’s valediction to his lover: “Cancer, heart attack, bypass—all // In the same year? My chances / Are 20%! And I’m f—g well / Ready, ready to go.” For Rector’s speakers, the past is a looming presence. “Now” presents a tender, comic, and ultimately beautiful overview of life as a lesson in disheartenment from early childhood to death, while “First Marriage,” “Beautiful, Sane Women,” and “Our Last Period Together” all document failed relationships with a humor so delicate that it can barely conceal the vulnerability it seeks . 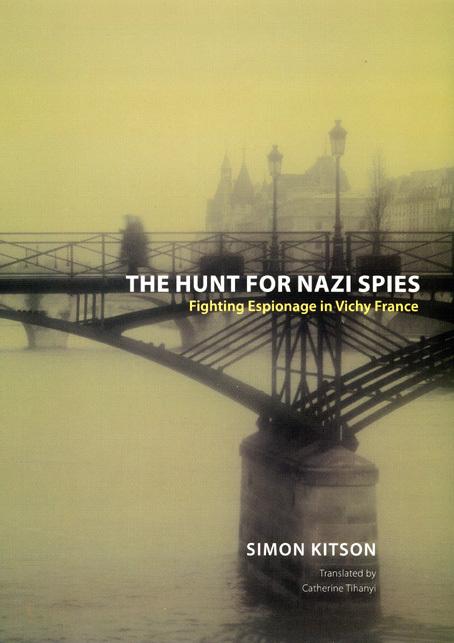 . .
First up is Simon Kitson’s new book The Hunt for Nazi Spies: Fighting Espionage in Vichy France, which seems to be receiving a bit of attention lately. Along with a piece in the New York Review of Books, the Literary Review also recently published an enthusiastic review of the book. Nigel Jones writes for the Literary Review: Despite excitable claims on book jackets, the number of original historical discoveries that truly alter our thinking about the past are few and far between. All the more reason to celebrate, therefore, when the genuine article comes along: Simon Kitson’s brief study of a neglected area of the politics of Vichy France is just such a work.… Our view of Vichy has been a uniformly black and white one—or rather, just black: that the regime presided over by Marshal; Pétain was pro-German, anti-Semitic, reactionary, ultra-Catholic and all in all a thoroughly bad thing. Kitson’s work challenges that view in one important aspect: the policy of Vichy’s military and police intelligence services was, in secret deed contrasting to its leaders’ words, anti-German. Read an excerpt from the book. Another revealing new work, David Shulman’s Dark Hope: Working for Peace in Israel and Palestine was . . .
Another review appearing in the March 6 New York Review of Books delivers a fine exposition of Simon Kitson’s new book The Hunt for Nazi Spies: Fighting Espionage in Vichy France. Writing for the NYRB Robert O. Paxton explains how Kitson’s book reveals a new dimension of the Vichy government’s complex and often strained relationship with the Nazi forces with which it collaborated. Paxton’s review begins: At first it sounds implausible. Did Marshal Pétain’s Vichy French government, notoriously ready to collaborate with Nazi Germany, actually arrest and execute Nazi spies? Simon Kitson, a young British scholar at the University of Birmingham, shows that it did. His exhaustive search of French military, police, and judicial archives found that between 1940 and 1942 Vichy police and counterintelligence officers arrested between 1,500 and 2,000 agents working for Nazi Germany. Some 80 percent of them were French nationals. About forty German agents were executed, though none of them appears to have been a German citizen; some German citizens were imprisoned, however. The arrests stopped in November 1942 when the German army overran the unoccupied southern half of France, following the American landing in North Africa. These facts were not entirely unknown. But no one . . . In the most famous defeat in American military history Lieutenant Colonel George A. Custer lost his life along with most of the rest of his 7th Cavalry at the now famous Battle of Little Bighorn, also known as Custer’s Last Stand. In the ensuing years the defeat has become a powerful symbol of America’s bloody past, with everyone from tourists and historians to Native American activists attempting to interpret and explain the battle in the context of the multicultural present. 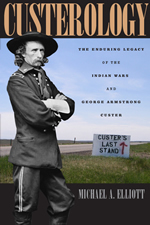 In the March 6 New York Review of Books, Larry McMurtry reviews Michael A. Elliott’s new book Custerology: The Enduring Legacy of the Indian Wars and George Armstrong Custer and explores the complicated question of why the battle retains such power for Americans today. McMurtry writes: Even as the sun set for Custer, dawn broke for the Custerologists—as Michael Elliott calls them—whose numbers now darken the sky. If you don’t believe me, write yourself some life insurance, then head up to Hardin, Montana, toward the end of June, and you’ll be able to take in not one but two reenactments of the Battle of the Little Bighorn, one sponsored by the town of Hardin itself (admission $16) and one put . . . Writing for this month’s edition of Natural History magazine Laurence A. Marschall reviews two recent books in the history of science: Pierre Laszlo’s exploration of the cultural and culinary phenomenon of citrus fruit in Citrus: A History, and Pascal Richet’s historical account of the various ways humans have attempted to record the age of the earth in A Natural History of Time. Marschall writes of Citrus: Can one describe a work of nonfiction as being happy? Well, this one is. Pierre Laszlo, a retired chemistry professor turned science writer, has approached the lore of citrus fruit with the élan of a master chef (the man is French, after all), mixing history, economics, biology, and chemistry to produce a book that will bring a smile to readers of every taste. 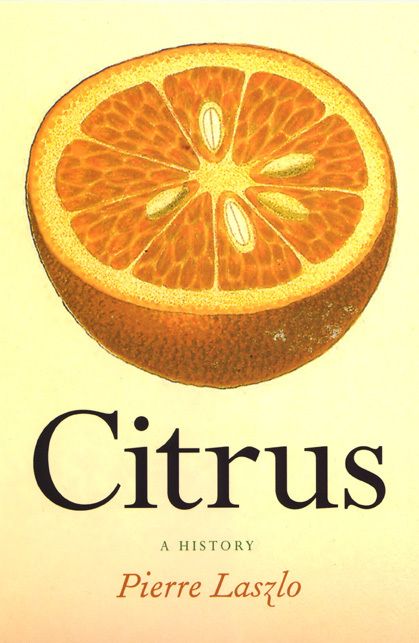 Until reading Citrus, in fact, I had not realized just how many tastes the title implied: lemon, lime, orange, and grapefruit, of course, but also citron, tangerine, kumquat, calamondin, and the self-descriptive Ugli, not to mention such variants as bergamot, mandarin, Valencia, ortanique, and Honey Murcott. Laszlo’s literary method is to present them as characters in an unfolding story. He begins with the domestication of the citron in Persia and the . 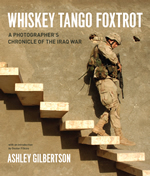 . .
Just in time for the opening of his exhibition at Melbourne’s Obscura Gallery, the Australian paper The Age ran an article last Sunday on Ashley Gilbertson and his new book, Whiskey Tango Foxtrot: A Photographer’s Chronicle of the Iraq War. As the article notes, Gilbertson is himself an Australian native and got his first taste of professional journalism “documenting the lives of Kosovar refugees seeking temporary protection in Australia.” The article continues: The project sparked an interest in the plight of displaced people that led him to West Papua, Afghanistan and eventually Iraq, where he has spent a total of 18 months since 2002. His early trips to the country were a hand-to-mouth existence, selling stories as he went, often depending on the goodwill of colleagues and strangers. Towards the end of a trip in 2003 he picked up work for the New York Times. Since he returned from that trip, his work has been exclusively for the US newspaper. His work while embedded with US marines during the 2004 Fallujah offensive made his name, earning him the prestigious Robert Capa Award for courageous photography from the US Overseas Press Club. But his experiences have left scars. He watched as . . .